Hey Everyone! For today's blog post I wanted to keep it short & sweet! I recently decorated my home for 4th of July and wanted to share how easy and inexpensive it was! Comment down below what you and your family are doing for 4th of July! So believe it or not, each of these 4th of July decor pieces were $3 or less! 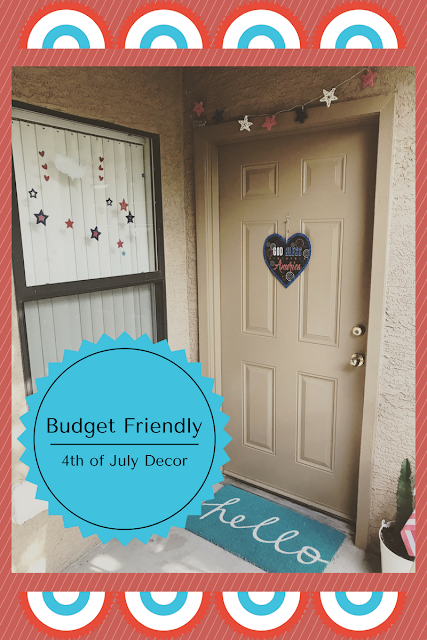 The American flags and the front door sign were from Dollar Tree, all at $1 each of course. The window decals (2 sets at $1 each) and the lights (being the most expensive at $3) were both from the Target dollar spot, making this decor only $8 total! If you enjoy 4th of July as much as I do or if you just love decorating I hope today's blog post inspired you to get creative and to never let a tight budget get in the way of having some fun!